Stevia is a virtually noncaloric, natural food sweetener with a checkered past and a debated future. Banned by Canada and most of the European Union, stevia finally obtained official government sanctioning in the United States when the FDA approved its use as a food additive in 2008, after rigorous debate regarding its risks and benefits. Promoted by some as a health food, yet banned or limited by governments, the political treatment of stevia may spur research but contributes to confusion in the meantime. Stevia has been used to sweeten beverages for centuries in its native Paraguay and Brazil. This shrub is primarily grown for distribution in China, near some if its major markets throughout Asia. Widely available and used as a sweetener in over two dozen countries for decades, stevia has historically been promoted as an herbal supplement in the United States. Herbalists say it can heal various conditions, including heartburn, high blood pressure, hypertension, water retention and heart problems. Many of these early claims have not yet been substantiated by rigorous scientific research, according to RxList. Early efforts to market stevia as a sweetener in the United States have been stymied, some claim, by lobbyists from an entrenched sugar industry disinclined to allow a new competitor into their market. Its future as a widely available sweetener with a place on tables next to Sweet'N Low, NutraSweet and Equal may rest with industry giants like Coke and Cargill. As major manufacturers market soft drinks and other foods that have stevia as the primary sweetener, chances for stevia's general acceptance may rise. Extensive evaluation of stevia's effects in humans and animals indicate stevia is safe for humans as a food additive, according to Food Insight. Proponents of stevia note that after three decades of use as a sweetener in Japan, there have been no significant problems reported. Stevia may cause adverse reactions in some people, including dizziness, bloating, muscle pain and numbness and may function as a diuretic. It may interact with lithium and may compound the effects of diabetes medications to lower blood sugar. It may trigger allergic reactions in people who are sensitive to plants in the chrysanthemum and daisy families. Stevia may offer several health benefits. It doesn't trigger an insulin response and so can be used as a sweetener by diabetics. Also, its natural, low-calorie sweetness may help reduce Americans' unhealthy, weight-inducing dependence on sugar, fructose, corn syrup and other high-calorie sweeteners. Stevia does not cause cavities. In pure form, stevia is 200 to 300 times sweeter than sugar. Stevia comes in several forms, including powder and liquid. A 1 gram packet of powdered stevia is sufficient to sweeten a 10-ounce beverage, the USDA says. The attraction of stevia is what it doesn't have: calories. A 1 gram serving of stevia has 1 calorie and about 1 gram of carbohydrate. It has no fat and no cholesterol, according to the USDA. 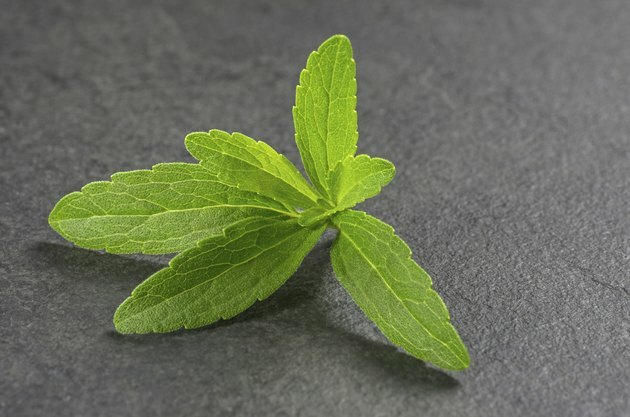 Innvista.com suggests the stevia leaf contains a variety of nutrients, including proteins, fibers, carbohydrates, iron, phosphorus, calcium, potassium, sodium, magnesium, zinc and vitamins A and C. However, in the form generally marketed to the public, these nutrients do not appear. The FDA lists stevia as having no vitamins or nutrients, even in a 1-teaspoon triple serving. The presence or absence of nutrients in the stevia leaf may be irrelevant given the minute serving size of stevia. The Journalism School: No Calories, Sweet and All Natural: Is Stevia Too Good to be True?